One minute he was in the bathroom and getting ready to go out, and the next, his family found him lying in the bathtub conscious but unable to speak. 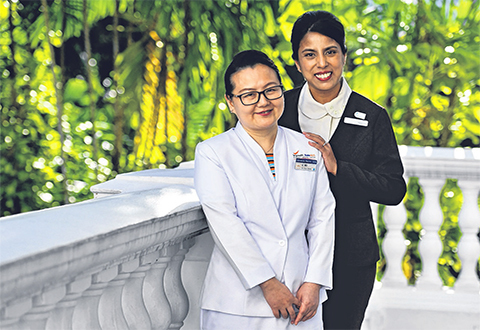 Mr Anindya Mitra, 68, was in Singapore visiting his daughter last July when he suffered the deadliest, most debilitating form of stroke - haemorrhagic stroke, which happens when blood floods in or around the brain and creates swelling and pressure. Doctors found a large blood clot in Mr Mitra's brain. It was growing bigger and an operation was needed urgently to remove it. As the bleeding was in the left side of the brain which controls language, Mr Mitra was now unable to utter a word from the five languages he had been fluent in. "We did not know if he would be able to speak again," said daughter Bedashruti Mitra Basu, 38. But in the days since, each language has come back, one by one. Mr Mitra, an engineer by training, is back in India. He has started playing the piano again and, with the help of physiotherapy, is walking as well. 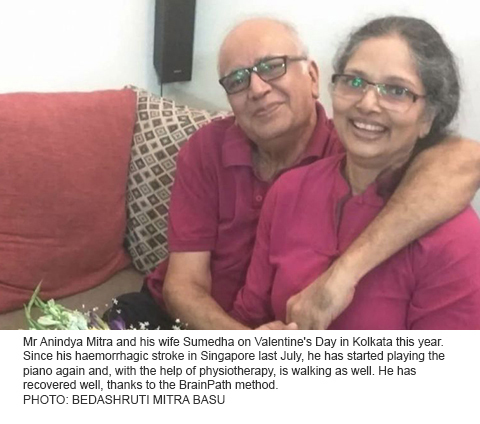 In fact, he and his wife Sumedha Mitra, 61, celebrated Valentine's Day at home in Kolkata last week, along with their neighbours and friends. "My dad's new hobby is to make ice cream and frozen yogurt at home. He looks for recipes and researches the right technique for my mum to follow," said Ms Basu, a company secretary. "Treating friends to an elaborate home-cooked meal gives them great satisfaction." Her father is one of the lucky few to have recovered well, thanks to new surgical technology made available here last year. But getting it here took a year of trying. 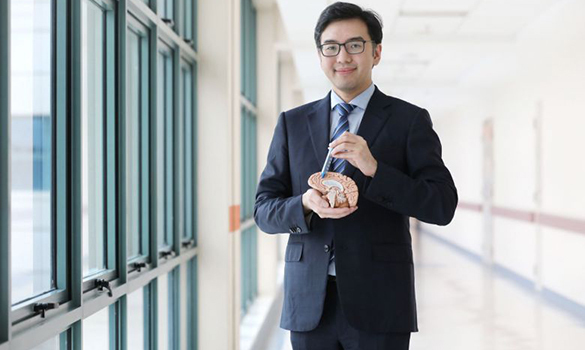 Neurosurgeon Nicolas Kon had read about a revolutionary surgical system developed in the United States which promised hope for haemorrhagic stroke patients, and he wanted to bring it to Singapore. The problem was that in 2016, when news spread in medical circles of the BrainPath method, it was not yet available outside the US and its inventors had no intention of taking it here. In Singapore, haemorrhagic stroke accounts for about one in five strokes. About one in five patients does not live beyond a week, and those who do are often left disabled. "A good outcome is rare," admitted Dr Kon, who is director of neurosurgery research at the National Neuroscience Institute (NNI). Generally, patients need surgery immediately to stop the bleeding, remove the blood clot and relieve any pressure that has built up in the brain. Surgery itself, however, risks further injury to the brain and complications from swelling. But BrainPath, as the new tool is called, was changing all that in the US. It allowed doctors to do keyhole surgery rather than removing a large piece of the skull to access the brain. And by manoeuvring through the natural folds of the brain rather than cutting into it to take out the blood clot, it bypassed the surgeon's dissector altogether. 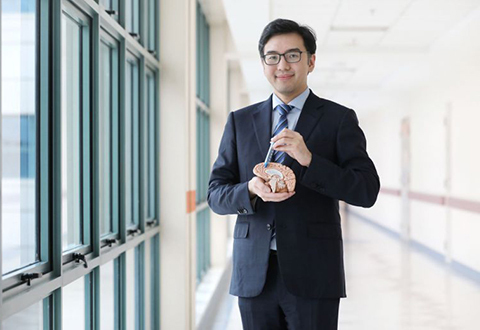 "Think of the brain like it's an MRT network," Dr Kon explained. "If you don't slice into the fibres, you don't damage the tracks." Dr Kon was determined to make the method available in Singapore. So began a round of talks with Nico Corporation - the company that had developed the BrainPath system - as well as doctors here. "I had to get the company to buy in, and doctors to buy in. It took us a year to get started," said Dr Kon. "There were a lot of phone calls, Skype calls, and I went to see them in the US, to explain what we wanted to achieve in NNI and in Singapore." The company's president and chief executive officer Jim Pearson became convinced, after some initial reservations. "We are in Singapore for one primary reason," he told The Straits Times. 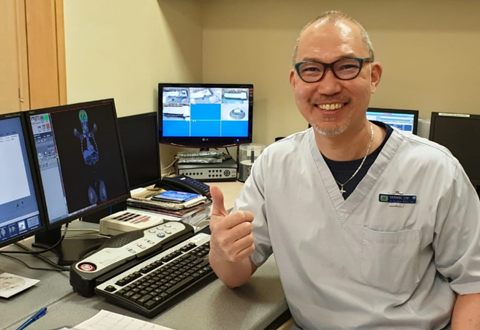 "We trust Nic (Dr Kon) and his commitment to his patients and his willingness to stay committed to the surgical approach and appropriate use of the technologies. 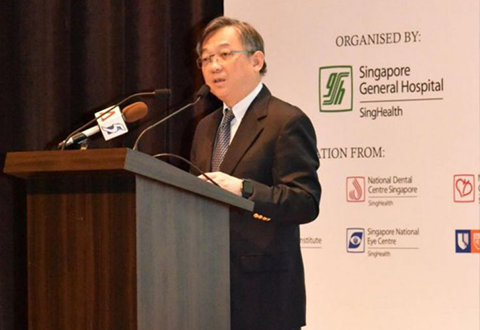 "The change he is undertaking for patients in Singapore is a big effort. He is leading the effort to modernise neurosurgery and it has been our pleasure to be a part of it." NNI has treated about 30 patients with the new procedure in the past year. Tissue from surgery is collected for research, which looks at inflammatory markers in the brain as a result of a stroke and how that can be stopped, as well as how to protect the brain from injury. 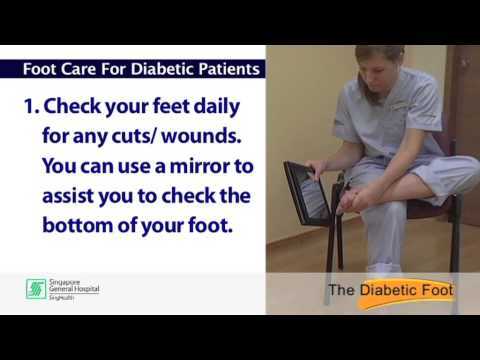 The research is being done by NNI, Duke-NUS Medical School and Duke University in the US. The team is also planning to organise training sessions for doctors in the region later this year. With BrainPath, patients cut their hospital stay by half, and more than one-third of them have recovered well, according to Dr Kon. The company worked with a local partner to train and educate the NNI team and provide day-to-day support, while key Nico employees made several trips to Singapore to conduct training. They continue to keep in regular contact. "We can really see the difference," he said. "As a doctor, I find it very satisfying to see the patient improving rapidly and to know I have the tools to deliver the outcome I want." Ms Basu said of her father's experience: "His recovery was amazing." One in six people will have a stroke in his lifetime. About 8,000 people in Singapore are afflicted by stroke annually. In 2017, cerebrovascular disease (which affects the blood vessels of the brain), including stroke, was the fourth-highest cause of death, accounting for 6.3 per cent of all deaths locally. Stroke is the No. 1 cause of adult disability in Singapore. Ischaemic stroke - a blockage in a blood vessel in the brain causing brain damage. Haemorrhagic stroke - bleeding in or around the brain. This accounts for 19 per cent of all strokes. Thrombolysis is a clot-dissolving medication administered into the blood stream by injection. It aims to dissolve the clot blocking the brain blood vessel to restore blood supply to that area of the brain. Endovascular treatment is a procedure to remove the clot inside the blocked blood vessel mechanically. Craniotomy: Clot removal with opening of part of the skull, followed by replacing that part. Decompressive craniectomy: Removal of part of the skull and the clot without replacing that part to prevent increased brain pressure. Minimally invasive methods such as removal of the clot using BrainPath, which was made possible through a donation of more than $350,000. Endovascular treatment: Inserting coils from inside the blood vessel to seal off the aneurysm to prevent it from bleeding again. Surgical craniotomy and clipping of aneurysm: Opening of part of the skull and placing a surgical clip around the aneurysm to prevent it from bleeding again. Face drooping: Is the person's smile uneven? Arm weakness: Can the person raise both arms and keep them up? Speech difficulty: Does the person's speech sound slurred or unclear? Time to call 995. If the person shows any of these signs, call an ambulance on 995.